The majority of people either blow past My Tho on their way to Can Tho, or they come to My Tho with a tour. That’s definitely not my style, and I think the town deserves a bit more time. That being said, a tour is easier, and you will save money. Maybe this blog should be called Itchy Feet without Douches, because I’d much rather spend a few extra dollars to not have to do a tour. 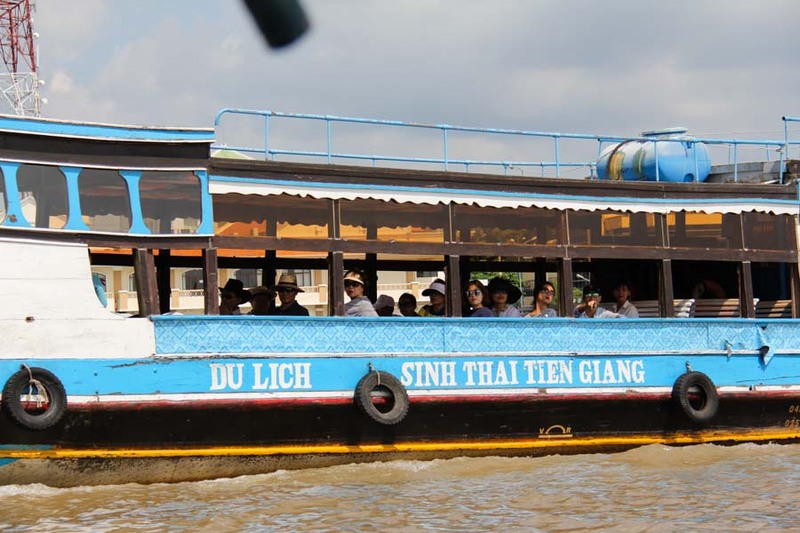 A typical My Tho tourist boat. Sara and I actually drove our motorcycle to My Tho. It was about 3 and a half hours of riding, and varied between pleasant and awful. 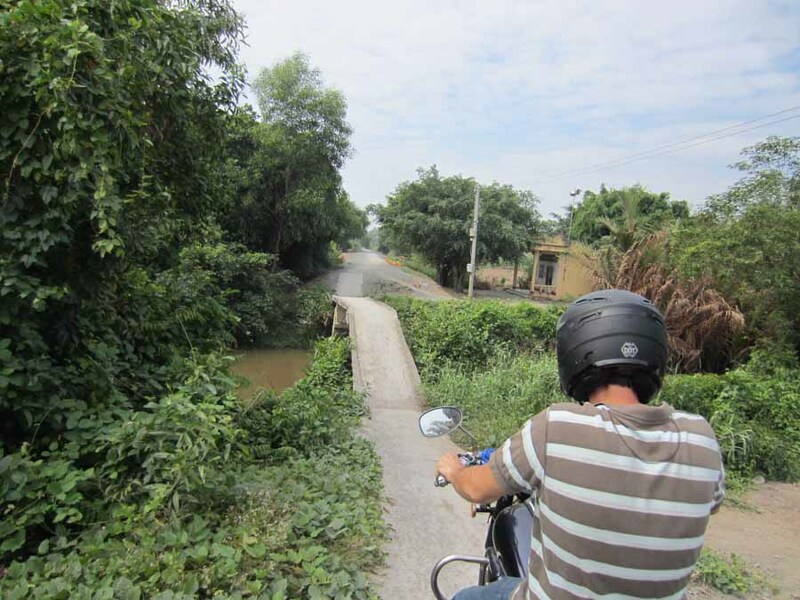 The route we took from Binh Duong province had us avoiding Ho Chi Minh City. The small towns were the highlight of the ride. The low point was probably dumping the bike after crossing one of the narrow concrete bridges — mainly because we both got bruised legs. Once we got to highway 1, the ride got dusty, noisy, and a bit scary at times. Not Evel Knievel – me about to take on a bridge. We arrived in My Tho around lunch, so we quickly found a bowl of hu tieu. It was tasty and well deserved. Hu tieu is a popular noodle soup in the Mekong Delta. It can be found almost anywhere in Vietnam, but since the Mekong area was once apart of Cambodia (where hu tieu is said to have been created), it’s extra popular in the delta. In fact, My Tho has it’s own version of hu tieu called hu tieu My Tho. 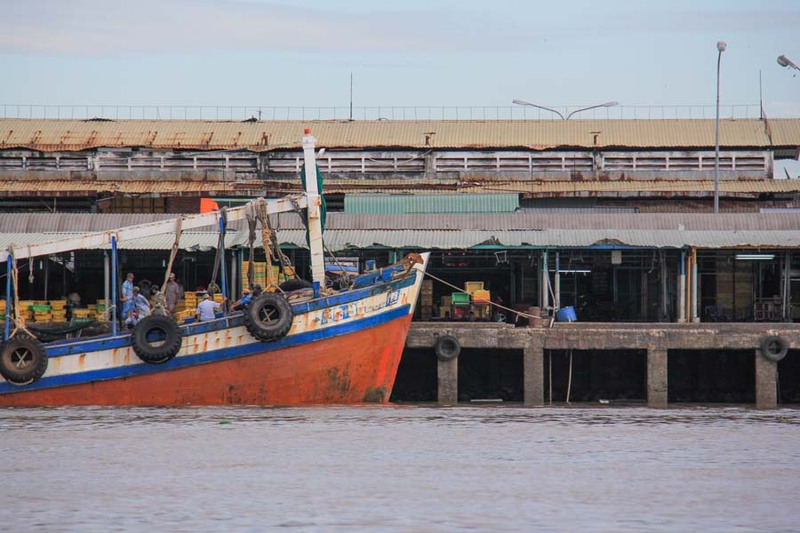 Generally, it has more seafood than the original version which is most often called hu tieu Nam Vang (Nam Vang meaning Phnom Penh, the capital of Cambodia). Things took a turn for the unappetizing when we saw a rat in the eatery. We stayed at the Minh Quan Hotel, and spent a little extra for a room that overlooked the rivers. The area where the town’s two rivers meet has a nice park where street food vendors setup in the evening. 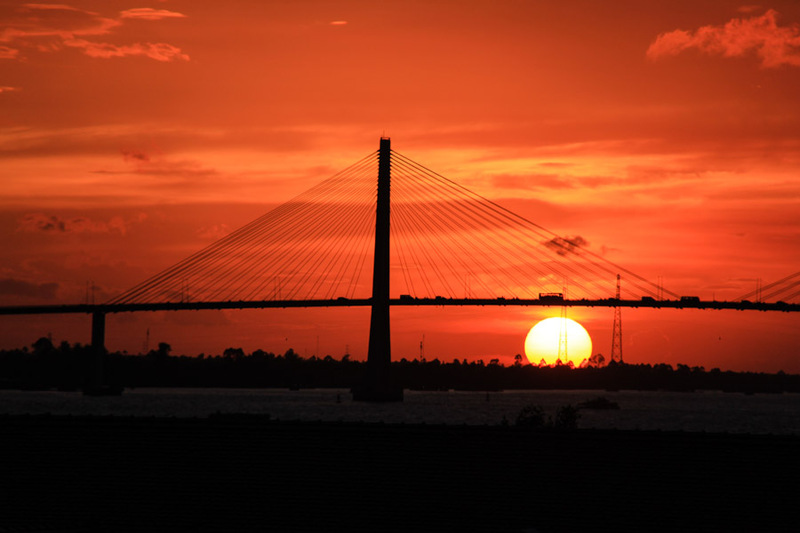 We drank a couple beers and watched the people until the sun set over the impressive Rạch Miễu bridge. For dinner we went to the night market and feasted on chicken wings and seafood rice porridge. I really love the atmosphere of Vietnam’s night markets. The colors from the neon signs. Locals are happy to be out. The food is usually good. The prices can’t be beat. It’s lively and happening — My Tho’s night market did not disappoint. The next morning, after having a sub-par hotel breakfast, we went down to the waterfront to find ourselves a boat tour. Technically, you’re not suppose to take a boat tour with anyone but the government regulated tour guides. C’mon, that’s no fun. To find yourself a private tour all you really have to do is exist. Within 2 minutes of arriving in My Tho, we were approached by a guy offering a tour — and that’s not an exaggeration, we were literally 2 minutes across the town line when a man pulled up alongside us at a red light. We were also stopped at our hotel a couple times. Like I said, just exist and the tours will find you. We met up with Hai, who took us to his friend’s boat. We agreed to pay 400,000 VND for 4 hours (cheaper than the 500,000 VND that the government office charges). Hai came along acting as the tour guide. The boat was a decent size and we had plenty of room to stretch out. The best part, the only annoying westerners were us. I suggest you watch the video below to get a sense of what the tour has to offer. I’m pretty sure the tours from Saigon would have taken us to see the same, or similar, places, but we managed to avoid the crowds by leaving at around 7AM. We only started to see crowds of people at the end of our tour. It gave us a taste of what could have been — boy were we glad we didn’t take a tour. The other positive to going independent was Hai, our guide. He was a character. About an hour into the tour, at about 8AM, he whipped out a bottle of rice wine. At the time, we were at a place where you can sample honey – usually with tea. Hai managed to score some rice wine and we had a bit of a party, playing a couple drinking games and sharing some laughs. The laughs kept coming throughout the day, specially when Hai flipped a switch at the coconut candy factory. It turned on a grinder that made a very loud noise, causing everyone to look at us. He turned it back off, made a face like ‘whoops’, and we hustled back to our boat giggling. 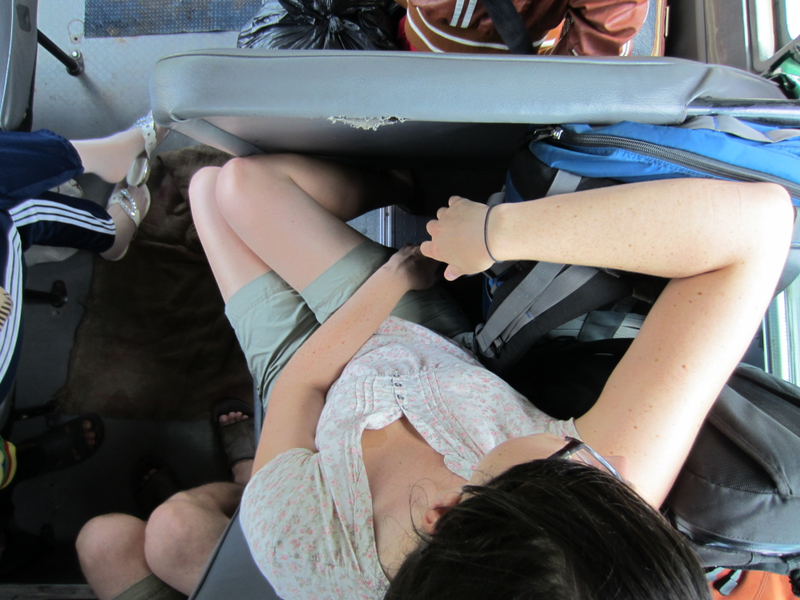 After the tour was done, we tipped Hai and the driver 100,000 VND and said our goodbyes. Our time in My Tho was done. I feel like we could have stayed longer, maybe made a visit to Vinh Trang Pagoda, taken a ferry over to one of the islands, checked out the Dong Tham Snake Farm, and just walked around looking at the beautiful colonial buildings. From Saigon, you’re looking at a 35,000 VND minibus ride from Mien Tay station. It takes about an hour and a half. You shouldn’t have to wait long to get a ride — a half hour max. It’s also possible to get a tour from Saigon and then bail on the bus ride home. That would save you quite a bit of money, but your tour will be packed with westerners and you’ll be herded around like cows. Your last Saigon option is to drive yourself. You can rent a scooter from almost anywhere. The ride takes about 2 hours, and isn’t exactly pleasant, but it’s an adventure. 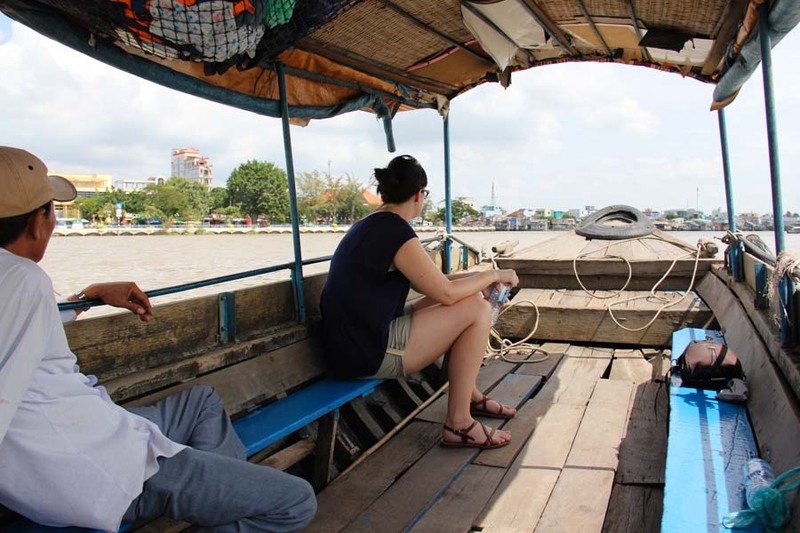 There are also lots of bus options to and from Ben Tre (about 15,000 VND), Vinh Long (20,000 VND), and Can Tho (50,000 VND). Just get to the bus station (see map) and you shouldn’t have to wait long, but be prepared to be a bit cramped on the ride. The hotels in My Tho aren’t as good as other more tourist-friendly places in Vietnam, but for 550,000 VND ($24.50) you can get a great room in Minh Quan Hotel (69 30/4 Street) that overlooks the heart of the city — where the two rivers meet. They also has cheaper rooms, but they don’t overlook the river. For the extra $4, I think the superior rooms are worth it. To get a sense of the view from the small balcony, watch the video in the Video section. My Tho is all about the Hu Tieu. There are a ton of places to get it, but the best we had was at Hu Tieu Banh Cam, which also serves up delicious banh cam. If you’re looking for something closer to the rivers, try Hủ tiếu chay, which is just north of the river road on Nam Kỳ Khởi Nghĩa. For a cheap delicious dinner in a great atmosphere, the My Tho night market is your destination. We had surprisingly delicious chicken wings, seafood rice soup, and beer for only 140,000 VND. Check the map below for precise locations. Great article! You inspired me to try and do this trip myself as well. Hopefully we find a tour guide as cool as yours! Glad to hear this. I don’t think you’ll regret it. Let us know how it turns out.